The anatomist and neurologist Andrea Verga, who was one of the first Italian doctors to carry out serious research into mental illness, was born on this day in 1811 in Treviglio in Lombardy. Verga’s career was notable for his pioneering study of the criminally insane, for some of the first research into acrophobia - the fear of heights - which was a condition from which he suffered, and for the earliest known experiments in the therapeutic use of cannabis. For a number of years, he held the post of Professor of Psychiatry at the Ospedale Maggiore in Milan. He also founded, in conjunction with another physician, Serafino Biffi, the Italian Archives for Nervous Disease and Mental Illness, a periodical in which research findings could be shared and discussed. Verga also acquired an in-depth knowledge of the anatomy of the bone system and the nervous system, and was the first to identify an anomaly of the brain that occurs in only one in six people, which became known as ‘Verga’s ventricle’. The son of a coachman, Verga was an enthusiastic student of classics whom his parents encouraged to pursue a career in the church, yet it was medicine that became his calling. He went to the University of Pavia, graduating in 1832 and becoming assistant to Bartolomeo Panizza, whose previous students had included Italy’s first Nobel Prize winner, Camillo Golgi. Verga spent much of his working life with sight in only one eye, the consequence, it might be said, of his failing to remember to take literally the biblical proverb ‘physician heal thyself’. During an outbreak of cholera, in which he attended many sick patients, he developed a serious eye infection, which he neglected to treat, and went blind in the affected eye. 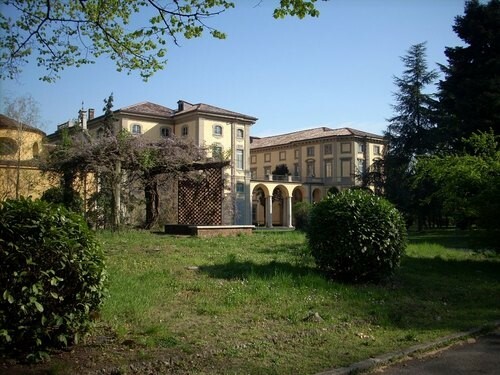 Nonetheless, steering himself towards the field of psychiatry and mental illness, in 1843 he moved to Milan, where he worked at the private hospital of San Celso, which cared for mental patients from the city’s wealthier classes. While working at San Celso, he is thought to have participated with other physicians in experiments on the therapeutic use of cannabis in mental health conditions. The plant had a history of medical use in a number of ancient civilisations. In 1848, amid the chaos of the first Italian War of Independence, he became the director of the Pia Casa della Senavra, Milan’s first public mental hospital. 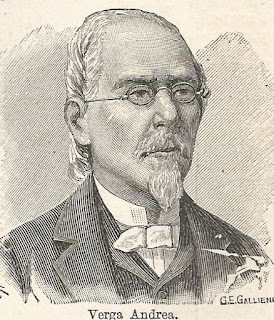 For several years his movements came under the scrutiny of the occupying Austrians, yet in 1852 he was offered the chance to lead psychiatric research at the city’s Ospedale Maggiore. There he pushed for reforms that fundamentally improved the service of medicine and surgery in Milan. With Biffi he helped construct a more accurate definition of the symptoms of mental illness and the concept of insanity, and its recognition as grounds for a different interpretation, in some cases, of criminal behaviour. Also, along with Biffi and Cesare Castiglioni, he argued the need for a more modern mental hospital in Milan. His arguments were rewarded when Senevra was closed and replaced, in 1878, by the Provincial Psychiatric Hospital of Milan at Mombello. Devoted to his work throughout his life, Verga never married. He did find time to become involved in local politics, however, as a councillor and in 1876 was appointed a Senator of the Kingdom of Italy. 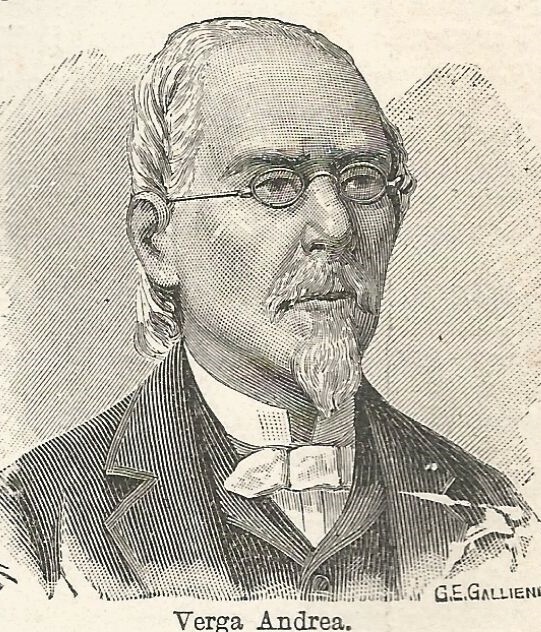 He died in 1895 and was buried in the Monumental Cemetery in Milan. The small city of Treviglio in Lombardy, where Verga was born, is about 20km (13 miles) south of Bergamo and 41km (26 miles) northeast of Milan. It developed from a fortified town in the early Middle Ages and, having been at times controlled by the French and the Spanish, became part of the Kingdom of Italy in 1860. 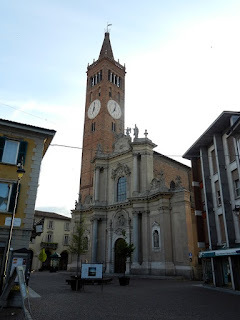 Its most visited attraction is the Basilica of San Martino, originally built in 1008 and reconstructed in 1482, with a Baroque façade from 1740, which is in Piazza Luciano Manara. Opposite the basilica is the historic Caffè Milano, founded in 1896, which retains the original turn-of-the century furniture and a counter in Art Nouveau style. 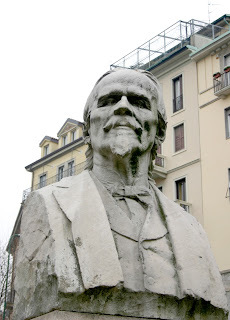 An enormous white marble bust, dedicated in 1903 to Andrea Verga, can be found in Largo Francesco Richini in the centre of Milan, opposite what was formerly the Ospedale Maggiore, which is now part of the campus of the University of Milan, created by the Milan sculptor Giulio Branca. The Ospedale Maggiore moved early in the 20th century to a vast new site not far away, opposite the university buildings on the other side, bordered by Via Francesco Sforza.